Solder free for quicker and easier installation. Corners made easy, simple power input. With the use.. 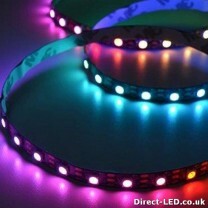 The high-brightness chip provides vibrant, bright and exciting colour output for maximum effect. 24v.. The high-brightness chip provides warm and cool white output for maximum effect. 24v 12W per meter. ..
17mm wide aluminium profile housing for LED strip (2m) Opal diffuser, end caps & mounting c..
Recessed aluminium profile housing for LED strip (2m) Opal diffuser & end caps included&nbs..
Plaster in flush aluminium profile housing for LED strip (2m) 20mm channel .. Wide rounded corner aluminium profile housing for LED strip (2m) Opal diffuser & end caps i..